How modern materials and regular brush maintenance can enhance performance and prevent vehicle damage. Industry-leading carwash owners understand that one of their primary responsibilities is to stay ahead of the curve when it comes to site and carwash maintenance. High up on the list of operator best practices is closely monitoring equipment performance and completing all recommended upkeep tasks. Being vigilant ensures that owners, managers and employees can depend on tunnels and bays to function effectively and efficiently, even during rush days. Now more than ever, the majority of carwash sites depend on various types of fine-tuned technology to generate profits. In the best carwashes, each service works together harmoniously — from presoaks and chemistry to brushes, curtains and dryers. This technical teamwork allows even the busiest locations to quickly turn out clean, dry vehicles in addition to satisfied customers. One piece of wash equipment that definitely contributes to superior results as well as customer satisfaction is the latest generation of carwash brushes and curtains. Modern brushes are now designed using an array of washing materials. These new media protect paints and clear-coats while increasing a business’ cleaning ability and aiding in producing dry vehicles. Since they have proven so important, how can carwash owners get the most life and the best performance out of modern brushes and curtains? When it comes to brush care best practices, Serko Kirikian with Kirikian Industries LLC recommends that every operator check his or her carwash’s brush material frequently. Kirikian, who is also a partner in multiple carwashes, states that tunnel brushes and curtains often require weekly, monthly and yearly maintenance steps. Further, if a check is done on the brush conditions and one is worn out, owners should not procrastinate and should replace it accordingly. Next, an operator must regularly inspect the equipment that utilizes the brushes, Kirikian continues. Checking that the equipment is working properly is an important step to ensuring that brushes and curtains will perform accordingly. Capturing this peak performance is what will allow the wash to deliver a clean and shiny vehicle to all carwash customers. For brush replacement, Adam Kelsey, director of sales for Belanger Inc., reveals that traditional media fills typically required an expensive and time-consuming reload when they began to break down. Modern carwash owners looking to increase the longevity of their cleaning media should now look for a low-impact yet effective fill. Fortunately, modern fills can be easy to maintain, and their longevity can eliminate the need for frequent, complete media reloads. New designs mean that full brush replacement is also less of an issue for modern tunnels. A brush option available to carwash operators today is designed so that each individual “hand” is easily replaceable, Kelsey notes. Here, an operator can switch out parts of the brush instead of having to replace everything on the wheel when the media is breaking down. Another way carwash owners can boost the performance and longevity of their curtains and brushes is through the use of quality chemicals, Kirikian states. A quality chemical works to break down the dirt on the vehicle and allows the different carwash materials to wipe any soils away. In addition, a quality chemical produces the lubrication essential for closed foam brushes, and it boosts both material longevity and noise reduction. 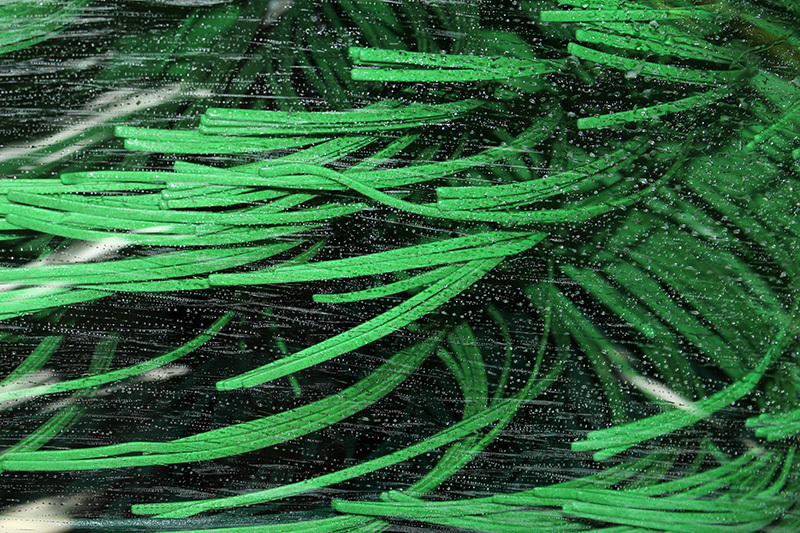 The latest advances in carwash brushes and curtains involve the updated materials used in the manufacturing process. Kirikian notes that materials such as closed cell foams and different drying materials have become popular in the modern wash process. Carwash equipment manufacturers have developed equipment that maximizes the benefit of these popular new foams. Working with the new drying materials, these upgrades generate a cleaner, dryer result for the carwashing public. Another recent innovation in carwash media now enables operators to reduce the rotational speeds of their cleaning wheels, according to Kelsey. Brush speeds can be reduced by two-thirds the speed of traditional wheels. This allows the equipment to “safely massage” the vehicle rather than whip the surface. Modern carwash brushes and curtains have improved over earlier options used in carwash tunnels by being more “vehicle friendly,” Kirikian states. Today’s closed cell foam brushes are softer than traditional carwash materials. As a result, the newer options are more forgiving, resulting in less damage and less disturbance of soft clear-coat paints. These materials also drove two changes across the carwash industry. “The improved materials allowed carwash manufacturers to reintroduce the top brush,” Kirikian says. Further, they allowed companies to develop drying equipment to place at the end of the wash process. This automated drying resulted in less use of employee labor. Kelsey again notes that traditional fast-spinning brush wheels had to rotate at three times the speed of current options in order for the wash media to reach the surface of the vehicle. At higher speeds, he says, “for all intents and purposes, it beat the car clean.” The results were scattered at best and, in some cases, vehicle damage occurred. This issue has been addressed through lighter, self-supporting wash media that reduces the rotational speed of the cleaning wheels significantly. “In short, today we see less beating and more cleaning,” Kelsey states. Carwash curtains are a tool many tunnels have depended on through the years of automated washing. Kirikian states that one new feature of updated carwash curtains is the use of different microfiber materials. The traits of microfiber have helped improve the cleaning offered by the traditional curtain while delivering a safer wash. Even so, curtains are used less in carwash tunnels today because of the reintroduction of the top brush, according to Kirikian. Carwash manufacturers have developed newer top brushes calling upon closed cell foams. As a result, many carwash operators replaced their curtains with top brushes mainly for two reasons: the improved cleaning of the “eyebrow” at the top of the window and the fact that less space is required by a top brush. As any owner will communicate, results are king in today’s competitive car care market. Kirikian explains that modern brushes help improve results in a wash by generating a dryer vehicle while providing a safe, damage-free wash process for paying customers. An added benefit that comes with the use of certain media is a shinier finish. This shine comes about because there is a reduction of disturbance to vehicles’ clear-coat paints. Brushes with drying materials also help produce a dryer vehicle, requiring less labor. These brushes are used to turn out dry vehicles working with a drying machine at the end of the carwash, Kirikian notes. Carwash manufacturers have developed drying top and wheel brushes that utilize a different type of drying material. They are located after the dryers and dry the remaining droplets left on the vehicle. In summation, Kirikian clarifies that brushes not only produce a cleaner and dryer vehicle for the customer, but they will also create and strengthen a business’ revenue streams. High-performance brushes and curtains are essential when it comes to tunnel washes, and owners can ensure longer life and improved performance by using quality chemicals and performing the regular maintenance recommended by manufacturers.